Cheesy Title Time.. Amerks Crunch Syracuse! · Let's Go Amerks! If the Amerks can continue the style of game they played on Monday night they should be able to start winning some fans back into the building. Everyone scored who is supposed to score. The four goals were scored by Chris Taylor, Graham Mink, Jeff Taffe, and Michal Repik. Four players that are here for that reason. The goaltending was exciting to watch. Alexander Salak was all over the ice… literally. Sprawling all over the place with his arms, his legs, his stick, his body. To say he played with an unorthodox style is an understatement. He’s likely to raise the blood pressure of everyone in attendance. Crunch goaltender Dan LaCosta stopped 11 of 12 shots faced in the second and a majority of those were great saves. 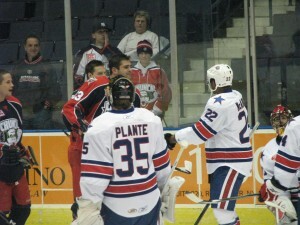 The Amerks were throwing pucks at him from all over the place and he continued to stop them. Continuing on with the Amerks…. The Amerks killed off six Crunch power play opportunities, two of those were 5 on 3’s. They were not pushed around by a “tougher” team. They scored two power play goals. Eight out of 18 skaters (excluding the goalies) for the Amerks scored a point in the game. If we don’t count Brady Calla or Andrew Sweetland it was eight out of 16 skaters. They even found a way to score an empty net goal at the end to solidify the win. We’ve been used to the opposing team finding a way to put on pressure late in the game, but not this time. Warmups started with the thugs meeting at the red line to discuss the game plan. On the Crunch side was Jon Mirasty, Kevin Harvey, and Tom Sestito. 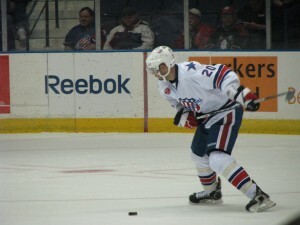 On the Amerks side was Mike Duco, Kenndal McArdle, and Tyler Plante. They were chatting things up until Rory Fitzpatrick (good job dad!) skated by and tapped McArdle to wrap things up. The rest of the first period saw a lot of back and forth hockey. Back and forth. Back and forth. It wasn’t exciting but it seemed like both teams were trying to figure out a pace for the rest of the game. Alexander Picard opened the scoring at 18:09 of the first period off of a great redirected shot. Nick St Pierre fired a shot from near the blue line and Picard was standing all alone to the left of Salak and redirected the puck into the net. The shot never would have found the net so it was more like a great play that is practiced often, get the puck towards the guy next to the net to redirect it in. Ellerby never should have been left alone like that but he did, we’ll move on. Chris Taylor tied the game 1-1 at 4:25 of the second period. Graham Mink shot the puck wide from the blue line and it went off the back boards. Mike Caruso was going around the net and pushed the puck next to the net and Chris Taylor was there to put it in the net. It almost looked as if it hit the post and then LaCosta’s pad and into the net. Half way trough the third period Graham Mink scored the eventual game winning goal on the power play at 10:10. He was standing in front of the net and was able to take a rebound and score the goal. Imagine that, players standing in front of the net and scoring goals. Jeff Taffe made it a 3-1 game at 15:33 of the third when he scored off a hard shot from the slot on the power play. Jeff Taffe winding up for his shot that found the back of the net to make it a 3-1 game. Michal Repik put the game away with an empty net goal with a minute left in the game. The game got better as it went on. It was filled with penalties and great goaltending. The team had two strong games this weekend and one horrible game. Hopefully a week of practices prepares them to play another great game against the Marlies on Friday. 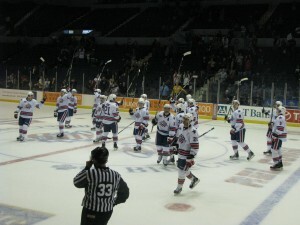 The solid Amerks win will certainly help those who say that the team does not need an enforcer. Some people will talk about the lack of ice time that Jon Mirasty saw as the game went on, but at the same time how much ice time did Calla and Sweetland really get? Unfortunately I was not able to get to the locker room for any quotes tonight. Hoping to work things out by Friday.